Passenger, what I call an ‘insight community vendor’ that fosters communities for brands that want to better understand their customers has named Michael Winner as SVP of Technology. He hails from Blink Logic as the CTO, and will spearhead product dev, QA and IT. MindTouch has filled it’s Community Manager/Customer Advocate Role. We are excited to have Katherine Smith (LinkedIn Profile) join from HL2. At HL2, she was Director of Marketing Strategy for Microsoft clients and created the social marketing strategy for SharePoint Social Computing. This post was collaboratively written on a wiki with my colleague R “Ray” Wang who focuses on enterprise strategies such as CRM. My focus is on customer strategy which encompasses social technologies. Together, we’re covering convergence of the emerging and incumbent technology systems, he’s cross-posted on his own blog. Jive Software made an announcement that they’re now incorporating listening service Radian 6 into their community platform suite, they dub it Jive Market Engagement. This gives internal teams that manage brands, topics, or influencers to discuss, manage, and assign tasks to follow up with real world –and real-time market events. An example? A company selling headache relief medicine can quickly be alerted to conversations with mommy bloggers in the social sphere, discuss in an internal, private community powered by Jive, then decide on how to quickly take action before it escalates. Currently, companies are doing this in a mish-mash of manual efforts using scraped together RSS feeds, Google alerts, and Twitter clients. The benefits of this partnership? Companies can now become more organized around the real-time web, develop a process to quickly respond and therefore be more reactive to customers. Yet, despite the automation upside to brand and customer management, this causes yet another disparate pool of customer data that IT departments will have to splice together –potentially giving customers a fragmented view. Companies should nod to this latest trend of social business software converging with existing company systems and develop an information strategy. The push to improve customer intimacy, move to a proactive customer experience, and convergence of Web 2.0 with enterprise class social business apps, drives new models and solutions. We’re tracking this living breathing reef and see social software, CRM, brand monitoring, email, and mobile quickly converging. Jive’s offering is really a customer relationship module in disguise, yet because of the web based offering, marketing can implement this psudo-CRM solution without involving IT. We continue to see technology adopted from business units -often at the frustration of not getting on the IT roadmap during budget tightening times. Being responsive to customers is ideal, but in the long run, it’s not truly effective if you can’t integrate it with your sales, service, or marketing systems. In the end, fragmenting customer data will result in disjointed user experiences for customers as separate departments will have disparate data for each customer. Jeremiah (business side) and Ray (IT side) come from completely two different worlds’ speaking two different languages. Yet they both know that these new technologies are going to force IT and Marketing to quickly come together. Expect to see more joint-blog posts merging these two groups together, because customers don’t care what department you’re in –they just want their problems solved. Expect a proliferation of social media monitoring solutions to emerge with a tie back to CRM, eCommerce, project based solutions, and collaboration software. Disparate sources will create fractured customer experiences. Single 360 degree view must be assembled and reassembled. Find tools to aggregate these new channels and sources. Consider how these new social business software platfrms will integrate back into data warehouses or customer interaction histories. Focus on data integration skill sets as process, data,meta data across hybrid deployment models. Data integration and master data management will play a role here. Don’t limit your responses to the corporate communication team and brand monitoring team –cascade this information quickly. While the discussions that will be had in Jive’s community platform will help to aid the customer triage problem, be sure to tie the process and data back to other customer facing teams. Remember, customers don’t care which department you are in. Use imported social data to create topic based aggregations. Looking forward, use the data that brand monitoring companies are unearthing and turn your product pages into trusted aggregations of conversations –not just static product pitches. Learn how future webpages will be more like collections of customer conversations. Jive has a slide show with details on the announcement, we’ve uploaded it here. We like Oliver’s take on how this makes true impacts to business and the real world, he cites how media events can now be tracked –and managed from the toolset. Read Write Web gives more color to the story and gives examples of how other companies are managing this. This conceptual slideshow demonstrates how the emerging and incumbent systems are quickly merging on the “Reef“. The Altimeter Group is a strategy consulting firm focused on providing companies with a pragmatic approach to emerging technologies. Note: Ray had a minor changes and links added, which I’ve updated since original post. I hope this is one of those resources you print out pin to your desk, and share with others. This is the core theme of this blog, the balance needed for successful web endeavors in organizations. I originally posted this diagram in 2006, then updated it in 2007, and it’s time to revisit the core structure of the goals and challenges of a Web Strategist, especially as I reset as I change roles. Who’s a Web Strategist? In a company, they often are responsible for the long term vision of corporate web properties. At a web company where their product is on the web, they’re often the product manager or CTO. Regardless of role, the responsibilities are the same, they need to balance all three of these spheres, and make sure their efforts are in the middle of all three. To be successful, the Web Strategist must understand (by using a variety of techniques and tactics) what customers and prospects want. Stemming from, ethnography, analytics, brand monitoring and primary and secondary research the end result should be a web experience profile and mental model. Specific skills needed: Ability to understand and implement research, strong understanding of user experience which would include usability, information architecture. Ability to synthesize content from a variety of real time locations such as web analytics, customer feedback from support and surveys and communities, and an ability to be empathetic to customers. Above all, this strategist should be able to predict where customers will be in coming years –not just understanding of previous or current states. Key Recommendations for 2009-2010: Focus on brand monitoring of customers in the social space. We’ve seen an increase in consumer adoption of social technologies which has caused a shift in where customers make decisions (not just on your corporate website). This is an opportunity to quickly identify who they are, what they want (and don’t want) and understand the language they use in order to reach them. Yet understanding customers alone isn’t sufficient, the Web Strategist must be able to achieve measurable business objectives. This leader must be able to first identify key stakeholders within an organization, capture their needs, prioritize, and balance into a plan that meets both their needs and the community. This delicate dance requires the strategist to balance the needs of a variety of internal teams, offset daily fire drills, yet meet the needs of the company. Many Web Strategists fall short here, they meet the goals and objectives of internal stakeholders yet fail to balance the needs of the community. The end result? A website where users rarely visit, and go elsewhere to make trusted decisions. Specific skills needed: Ability to communicate within a company, understand and prioritize emphatically the needs of multiple business stakeholders and prioritize. This leader will also need to be a mediator and must defuse the assertive business stakeholders will cool logic and business acumen, as well as ensure the web team operates in an efficient operation. Management skills are critical here: project management, human relations, communication, and the ability to define clear concise goals based on dates for content and technical teams. Lastly, the core of the role includes skills in marketing leadership, advertising, media, product management and marketing. Key Recommendations for 2009-2010: In many cases, the recession has clamped budgets down to operations with budgets coming from campaigns and business units to innovate. Where budgets are limited, learn how to use inexpensive technologies like community software, blogging, or status update tools internally –yet have a long term plan for how they work. On the external front, provide guidelines and resources to internal teams to use social before it cascades to many areas of the company without common framework –fragmenting the customer experience and wasting business resources. Lastly, the Web Strategist should be an expert in their own realm of internet technologies. They’ll need to know the capabilities and deficiencies of their current arsenal of tools as well as adopt new technologies that are ever emerging. Leaders in this space often become complacent configuring current systems and forget to plan into the immediate roadmap new technologies that widen the breadth and width of what can be done. If the Web Strategist is performing the Community sphere correctly, they are already watching how the use of customers technology adoption is changing. Specific skills needed: Ability to understand the workings of web architecture in the internet field. While they are not technical experts they should be able to understand the impacts of these technologies to the business and community. They should also be watching for emerging technologies and devote a percentage of resources to research and development for new technologies –never falling behind. The strategist should demonstrate skills of innovation, and experiment and practice with new technologies as they emerge first hand –but by keeping a focus on long term business objectives. Key Recommendations for 2009-2010: Web Strategists need to prepare for a new set of connected devices that are quickly emerging. While social caught most companies off guard, mobile technologies within and outside of your company will impact how information is quickly shared. 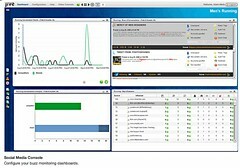 Start by analyzing related applications and mobile social networks in rich mobile devices such as Blackberry, iPhone, and Palm Pre. 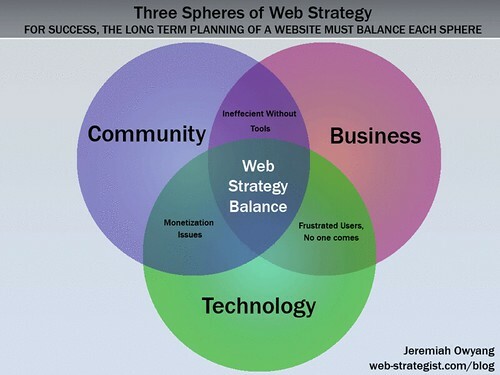 To be successful, the Web Strategist must balance all three of these spheres. Becoming a master in each of these spheres requires incredible dedication, so the leader must rely on their team for input, actively seek out education, attend workshops, and read books on the various subjects. Also, if this helps to shape your career, or you’re a hiring manager for this role, I hope it helped to define what to look for. One of the best ways to conduct research isn’t just to go to the field, but centralized the field. Last week, mobile analyst Michael Gartenberg was in town for Apple’s new video iPod announcement and there were dozens of others in town for GigaOm’s Mobilize conference, so we organized a Tweetup on Union Square in SF. The topic? The future of mobile. 30-40 folks showed up from startups, PR firms, folks from the mobile team at Microsoft and even the Financial Times. What’s the trend? Convergence. Mobile devices are giving birth to applications that triangulate geo data, compasses, and social data and serve up unique experiences. Facebook just released a lite version of it’s site –in order to meet the needs of the mobile experience around the globe. Last night, I played the new Beatles Rock Band edition, it’s important to note how video game entertainment has both social components and a revival of music made popular decades ago –although some musicians worry this detracts from people playing real musical instruments. Expect other genres to appear as this expands to Hip Hop with Snoop Dogg. We’ve already seen mobile versions of these games appear, so it’ll be interesting to see how mobile device that conncect to each other make these games portable, social, and who knows what. Stay tuned, next month I’ll have a tweetup around the topic of just mobile social networks like FourSquare, Twitter, BrightKyte, and whatever comes next. Slides: What’s The Future of Business? Thanks for everyone who attended our webinar today (799 registrants, 458 attendees) to discuss Altimeter’s vision on the future of business, and to tell a little about ourselves. Yet, for us to be successful, we know that we need to be part of the larger community, so we only presented till the half of the hour and opened it right up to discussion by taking questions from the webinar, and tweets that were tagged #futurebiz. Ironically, it became a trending topic, then the twitter spammers quickly moved in to offer cialis deals. We learned a lot. Looking inside the company, this was a great internal exercise as it forced us to really work together, define our vision, what and who we are in a public way. We also learned from the real time and live feedback: Some folks wanted more detailed content, others preferred some speakers over others, and we made the mistake of forgetting to record the conversation so only the slides are available. The learnings never end, but now I’d like to get your opinion on where you think the future of business is headed. Take a look at the embedded slides above, and come up with your own: How must business change in the future for companies to be successful. Love to hear from you: What’s the Future of Business?